Any developers looking for a free phone? I got ‘em. Yesterday, Microsoft announced the future of Windows Phone, and it looks amazing. Multicore devices, multiple resolutions, native code, NFC (near-field communication), and a remarkable digital wallet solution that I’ve been begging for from ANY mobile platform for 10 years now. In the meantime, yesterday was an announcement. Devices aren’t available yet, and the SDK won’t be available until later this summer. So how do you get on this bandwagon today? By building apps for Windows Phone 7.5. 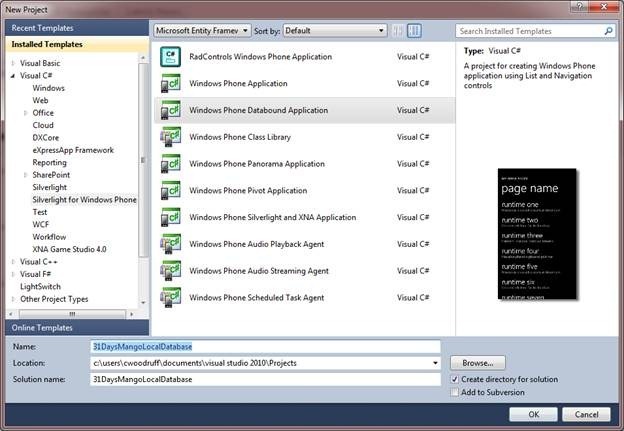 Any apps you’ve built today will run on Windows Phone 8. Heck, they’re even going to compile them in the cloud for you, so that they start and run even faster. 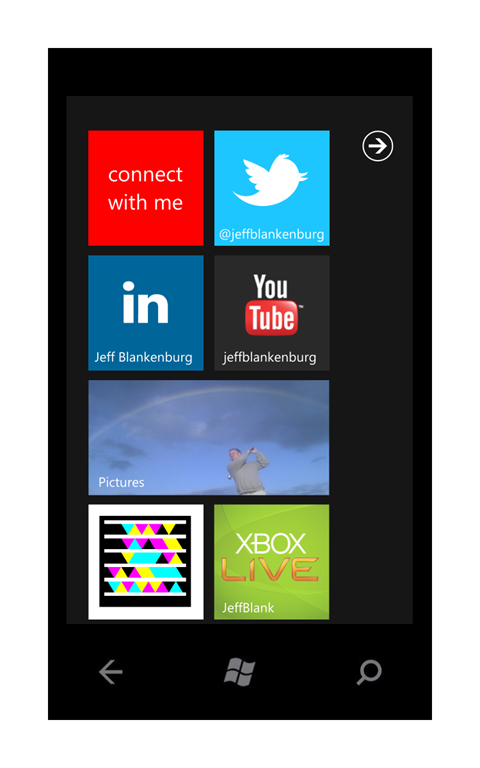 You’ll be able to take advantage of the new features of Windows Phone 8 in your v2.0 app. You’ll have all of the fundamentals you need to build apps for Windows Phone AND Windows 8 at that point. I know what you’re thinking: “Jeff, why would I build an app today, when the Windows Phone 8 SDK will be available this summer?” Because you’ve waited this long already. The Windows Phone 7 SDK was available 2 years ago, and you haven’t gotten started. What suddenly changed your mind? Oh, and I’ll give you a free Nokia Lumia 710. That’s unlikely to happen for Windows Phone 8. Before you jump the gun, there are a couple of restrictions on who I can give these phones to. If my list of requirements doesn’t seem overwhelming, and you’re interested in getting a free device, email me at jeblank [at] microsoft [dotcom] and I’ll be happy to discuss it. If you truly believe that people you’ve never met would use it, it qualifies. So what are you waiting for? Send me an email, and we’ll get this started! 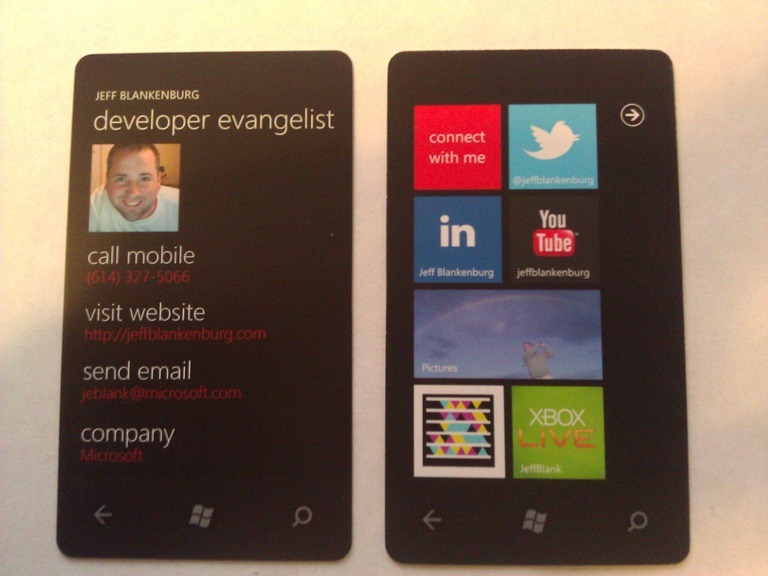 And the final product, in terrible lighting…(the cards are actually a dark black). I am one to share my work, however, so if you would like to download this template to use for your own cards, I’ve provided them in two formats: Expression Design and Adobe Illustrator. These were originally created in Expression Design, but the Illustrator files I’ve provided do work, but they’re just a little less accommodating (fonts are not editable, for example). Download a 60-day trial of Expression Design. Download a 30-day trial of Adobe Illustrator. Once you’ve downloaded the templates and the software (if you need it), feel free to edit them to your heart’s content. Some of you may not have a YouTube channel. Others may not use LinkedIn. Make it your own. Change the colors. Definitely change the Tag. Finally, you’re going to need a place to print them for a reasonable price. I’ve shopped around, and I found a print shop local to me that was willing to print 1000 of these cards on a heavy 16pt card stock, with a smooth UV coating, and rounded corners for $110. They’re familiar with the cards, and they will do a phenomenal job for you as well. You can find YesPress online at http://yespress.com. Their price was nearly 72% less than every other print shop I talked to, including the online card makers like Moo ($389.70), but their quality was exactly the same as Moo’s rounded corner business cards. 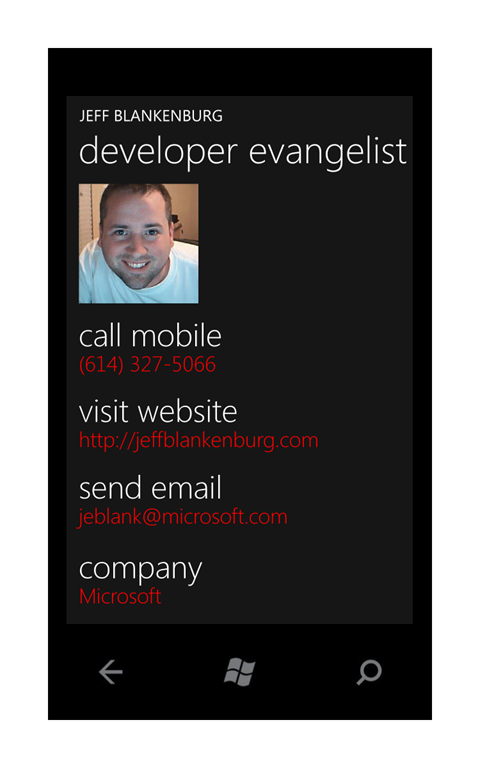 Yesterday, I was working on a Windows Phone application that is very date-centric. I show the user a list of events for a specific day, and the page always loads data for “today” by default. They can always change it (I’m using a DatePicker for that), but I wanted to give them an easy way to return to whatever “today” may be. As you can see, there is a “today” button in the ApplicationBar. (In the image, today must be July 7th.) Anyways, I did some investigation, and came to a conclusion that either that image is being generated on the fly, or they’ve included 366 images in their project, to accommodate every possible month/date combination. Since I’ve never done any dynamic image generation before, it seemed like more work that I was prepared to accomplish in the short timeline I had to finish this application. So, I went ahead and created the 366 images that are necessary to make this functionality happen. Or, if that’s not convenient, you can download the entire collection of Windows Phone Date Icons in a ZIP file here. These images are completely free to use, I only ask that you comment here on how you used them. Fair? I’ve seen many people posting app recommendations for their phones, and I thought I should participate. (Specifically Brian Jackett and Brian Graham.) I tend to prune the apps on my phone quite often, so while this is an alphabetical list of the apps and games on my phone, consider them a recommendation as well. They wouldn’t be on this list if I didn’t use them regularly. Of all of the weather applications available, this one is the best. It makes it easy to manage multiple cities, pin each of them to the start screen, and gives you real-time alerts when the weather turns bad. Written by my friend and colleague Dave Bost, this simple application allows you to use your phone like a message ticker, scrolling a large-text message across your screen to a person you might be able to see, but can’t talk to. This has been very handy as a proctor for speakers at a conference, and for getting a message into a conference room through a window. All the features of Amazon.com in your pocket. Wishlists, a very Metro interface, and a pinnable barcode reader are only the beginning. I have used this many times to order a product from Amazon while standing in a competing brick & mortar store. For those of you building applications for Windows Phone, this is a must-have app. It lets you track your apps, monitor your feedback from all of the geographies your app is available for, and even offers Bing Translate when it’s in a different language. A great little application to keep my kids entertained. A simple drawing tool with a huge number of options. More than just a portal to ESPN.com, this tool actually uses your ESPN credentials to remember who your favorites teams are, and shows you a customized dashboard with your teams, and their past and future games. Windows Phone does a great job of integrating with Facebook, but for those niche needs (like managing photo albums), the Facebook app is perfect. I do a good bit of driving, and sometimes there’s a game on the radio that I’d like to listen to. Instead of fighting with the Scan function on the radio, I just use this app, with its geolocation, to determine what the ESPN Radio station is currently. Great app. If you’re ever feeling down about yourself whatsoever, crack open this application, and you’ll feel better in a hurry. This app exposes the data from fmylife.com, where people post short messages about the terrible things that happened in their lives. Sad to say, it’s hilarious most of the time. An amazing tool in the global scavenger hunt that is Geocaching. If you’re not familiar with the concept, check out geocaching.com. It’s great fair-weather fun for the whole family, and this app makes it much easier to do. A great way to figure out what other movie that guy with the mustache has been in. A go-to resource for movie and television trivia. Tired of all of those rewards cards in your wallet? This app stores all of them electonically, but still makes it possible for you to scan them at the checkout. Syncs online, so when you change your phone, you don’t have to enter all of the info again. The only major pizza chain on Windows Phone, you can take care of your entire order right from your phone. Place your order, pay for it with a credit card, and track its progress. If I could convince the driver to bring it directly to my couch, I’d never have to get up. I have no idea what the name of this app means, but it allows me to wirelessly control my Roku boxes in my house. It communicates over my wireless network, and is actually an improvement over the actual Roku remote control. As a person that travels extensively, TripIt has been an invaluable tool for managing all of my reservations for hotels, rental cars, and flights. Having an app on my phone makes accessing all of this information on the go much, much faster. It’s an app that exposes all of the data in Wikipedia. What more do you need? There are many, many more games on my phone than are in this list, but I’ve only included those that I’ve played more than once. Most of the games on my phone were downloaded for (or by) my kids. The alphabet has been divided into a set of sliding tiles, and you need to move them appropriately to reconstruct the alphabet in order. It’s funner than I just described it, I promise. Use a catapault to launch birds at the pigs that stole their eggs. High replayability factor, great time waster. Themed with life’s scariest creature, the clown, you use ropes, chains, ramps, levers, and some physics to get the clowns in the right buckets. My 3 year old son found this in the marketplace, and it’s definitely worth the 99 cents. You start with 4 elements: wind, water, fire, and earth. By combining them, you’ll eventually create over 195 things. It’s not nearly as easy as you think, and plenty of fun. Guide a red ball through progressively more difficult levels. Tap the screen to jump over the hazards. WARNING: the music in this game is an earworm. You steer an ever-increasing number of boats into their ports, unload their cargo, and send them back out to sea. Meanwhile, you’ve got to avoid having any of the boats crash into each other. Looking for a reason to feel stupid? This little puzzle game will test you. Outstanding and addictive. A cool physics based game. Knock the green bricks off the screen, leave the red ones. Harder, and makes you want to keep coming back. The most fun tower defense game out there. I’ve paid for this game on five different platforms now, and it’s still addictive. A resource and time management strategy game, you own a hair salon, and have set some lofty career goals. Despite the fact that this game is set in a salon, it is surprisingly fun, even for a guy like me. A Scrabble game that isn’t Words With Friends. The interface is great, and playing against a computer or human is available, even remotely, like WWF. However, the moment WWF is available for Windows Phone, I’ll likely drop this app. Simple. Confirm that each word in a set of 15 is spelled appropriately. Sounds easy, right? I’m a great speller, and I win maybe 60% of the time. Very similar to FastBall 2, you are Mike, and you’re on a forced move through levels that require you to jump at appropriate times to avoid the obstacles and grab the three coins. Very addictive. A great fresh take on the old (and tired) labyrinth category, you need to get the metallic marbled together, where they become slightly larger. Combine all of the marbles on the level to finish it. A kind of crowd-sourced Boggle game. You play against the world in fast-paced games. Very fun if you like word games. An app that lets me control my Xbox 360? Yes please! Want to change your Windows Phone emulator? Once you’ve done that, your emulator can look like one of the images below!